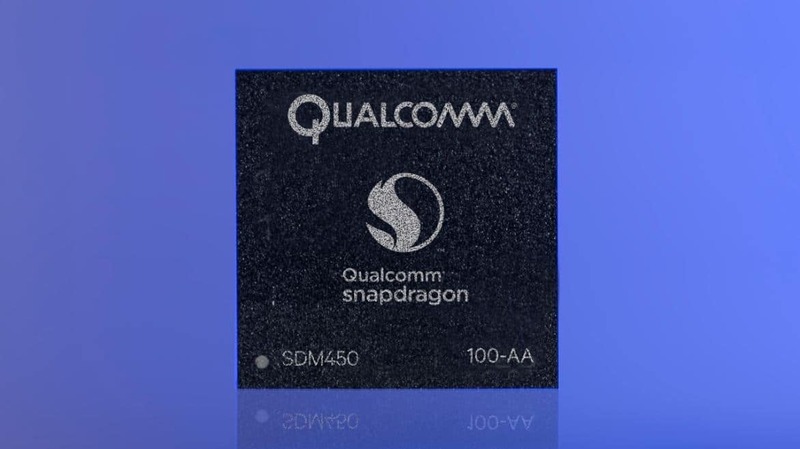 The Qualcomm Snapdragon 450 Mobile Platform has brought in a lot of power in the low-end Snapdragon 400 tier. If you’re looking to buy a smartphone which has the Snapdragon 450 SOC, then you’ve arrived at the right place. A system-on-chip is one of the most important components of a mobile device and is responsible for its performance, speed, stability, connectivity, and a lot more. One of the biggest changes Qualcomm has done in this Processor is bringing the 14nm FinFET fabrication. This change will make the smartphones power-efficient, and hence it will enhance the Battery life. The other benefit of this process is that it will make the phones slightly faster due to the decrease in the gap between semiconductors inside a CPU. Snapdragon 450 also has a better GPU and Modem than its predecessor. Let’s first talk about the specification, and then we will benchmark and review this Mobile Processor by Qualcomm. Its specifications are a lot similar to that of Snapdragon 625. You can better say that this CPU is an underclocked variant of SD 625. It is an Octa-Core CPU with eight ARM Cortex-A53 cores which can go up to 1.8GHz frequency. But the maximum frequency of Snapdragon 625 is 2.0GHz. 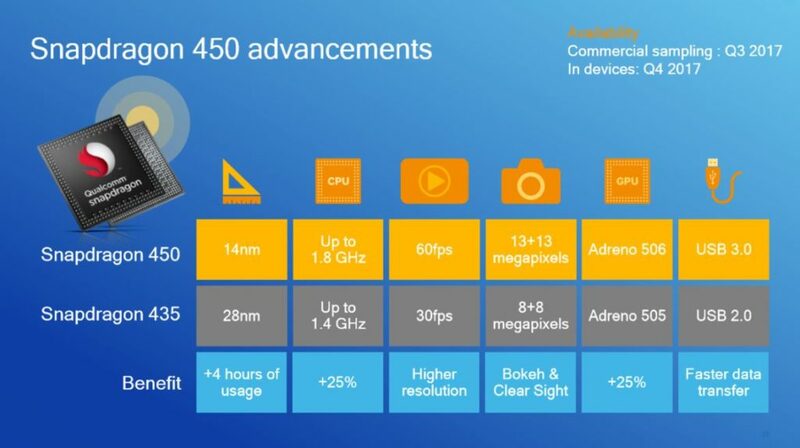 The predecessor (Qualcomm Snapdragon 435) also used eight Cortex-A53 cores but those run of 1.4 GHz frequency. Coming to the Graphics Processor, it uses the powerful Adreno 506 GPU which we have already reviewed a few months back. Do check out our review of Adreno 506 to learn more about the gaming capabilities of this SOC. It uses Single-Channel LPDDR3 RAM and the Hexagon 546 DSP. Coming to the Modem, it has the Qualcomm X9 LTE Modem just like the Snapdragon 435 and 625. This Modem supports a download speed of up to 300 Mbps. It also supports Fast Charging with the help of Qualcomm QuickCharge 3.0 technology. However, it is the choice of manufacturer whether or not to implement fast charging on their smartphones. Some other changes include the support for better Dual-cameras up to 13+13 Megapixels. This feature enhances the real-time bokeh effect, and the dual ISP (Image Signal Processor) ensures better Image Processing capabilities. It supports Bluetooth version 4.1, and the USB version is 3.0. The major improvements done in this Processor can easily be observed in the above picture. The 14nm manufacturing ensures four extra hours of smartphone use as compared to the Snapdragon 435. Even though the CPU cores of both these Processors are same, the higher clock speed makes it 25% faster. This SOC also supports 60fps video recording and playback. Just like the CPU performance, the GPU performance is also boosted by 25%. On Geek Bench, Redmi 5 attains a score of 754 in Single-Core and 3,437 in Multi-Core. On Antutu, the scores of Moto G6 and Redmi 5 are 57,862 and 55,493 points respectively. Visit Snapdragon Processor Rankings and List , for the rankings of all Snapdragon Processors. The above articles should give you a better idea of the performance, and the same could apply for SD 450 as well. Now it is time to discuss this Processor’s capabilities in-depth I’ll rate it in each category. The performance of a SOC mainly depends on the CPU Core used, No. of cores, the Core Frequency. This Processor using eight ARM Cortex-A53 Cores that can go up to a frequency of 1.8GHz. Compared to the other cores like Cortex-A72 of Snapdragon 650/652/653, Cortex-A53 cores are weaker, but there’s no task which they can’t handle. There will be a lot of difference in benchmark scores however not that much in real-world performance. Rest I can assure that the phones won’t lag while performing daily life tasks. The power efficiency depends on how much power the Processor consumes. As SD 450 is built using the 14nm manufacturing Process, it consumes low-power. This, in turn, results in better Battery Life, Improved Performance, and negligible CPU throttling. As there won’t be any throttling issues, the phone is unlikely to heat even while performing heavy tasks such as gaming. When we talk about Gaming, the GPU plays the major role, and here, in this case, we have the Adreno 506 GPU. This Graphics Processing Unit delivers decent performance on paper when it comes to real-world performance; it performs exceptionally well. As the 14nm Process reduces throttling, this could indirectly impact in the performance of this GPU. It can handle every Android game with ease on a 1080p Display. Being a low-end Processor from Snapdragon 400 tier, there’s no doubt that it offers the best value for money. The other similar low-end Processors from MediaTek are nowhere near the competition. Without any doubt, this one will get a 5-star rating. However, Vivo V7+ is totally overpriced and not worth it. Soon, there will be better phones in the market with Snapdragon 450 having a price less than half of that of Vivo V7 Plus. Qualcomm has also included a Faster Modem and better Camera support, and this one also has better connectivity with USB 3.0. Qualcomm has also added the Fast Charging Support. Unfortunately, this one still uses Single-Channel LPDDR3 RAM but expecting Dual-Channel and LPDDR4 RAM at this price will be too much. Undoubtedly, Qualcomm has brought up the performance of low-end Processors to a whole new level with the launch of Snapdragon 450. They’ve simply brought the performance of mid-budget phones to the low-end ones. 2018 is surely going to be an exciting year for low-end as well as a mid-range phone as they will be running on much better Processors like SD 450, Snapdragon 630 and Snapdragon 660. So, at last, I will say that it is a great Processor which can low-end phones even better. However, the SOC or the Processor shouldn’t be the only factor before any phone. Look at every specification, compare the phone, watch the reviews and then make a decision. If you need any help with selecting the right smartphone, you can always comment on the article, and I’ll reply you as soon as I can. Thank you for this review. I hope Redmi 5 gets launched soon with Snapdragon 450. Yes, as the Redmi 3s uses Snapdragon 430 and Redmi 4X has Snapdragon 435, Redmi 5 and some of the other low-budget phones that will launch in Q4 2017 and next year are likely to be powered by Snapdragon 450. I’m a gamer and I love playing heavy games such as Lineage 2 Revolution. Can Snapdragon 450 run the game smoothly? I’ve been thinking of buying inexpensive smartphonesb that can run heavy games. Yes, it can run heavy games. But which phone are you looking to buy? Hi im from Philippines, and we have here a new model, oppo a3s, do you think this would be grate for low end phone, that has a sd450, and adreno 506 soc? Thank for the reply!!! Hello, Sir, I want to purchase RealMe 2, Is the Processor good or not? Is there any lag in daily usage?